For years, Houston-area leaders have debated the merits and drawbacks of the “Ike Dike” and “Centennial Gate” — two rival plans devised after Hurricane Ike in 2008 to protect the Bayou City and its massive petrochemical complex from a storm surge during the next big hurricane. On Tuesday, the Rice University-based group behind the latter vision proposed an entirely new option it hopes can evolve into a consensus plan, even as several other entities at the local, state and federal level are pursuing their own solutions. The "mid-bay” plan — contained in the first of three annual reports from the center, and so far lacking a catchy moniker — calls for installing a storm surge-deterring gate as tall as 25 feet across the nearly 700-foot-wide Houston Ship Channel near the community of San Leon. The manmade channel connects the Gulf of Mexico to the Port of Houston, the busiest seaport in the U.S. by some measurements. SSPEED Center officials say sophisticated storm modeling shows the structure would — in a Category 3 hurricane with wind speeds about 15 percent higher than those during Ike — “significantly reduce storm-surge flooding in both the Houston Ship Channel and in the heavily populated west Galveston Bay communities that are difficult to evacuate." While throwing a new option into the mix, the SSPEED Center report also expands on the Centennial Gate and Ike Dike concepts — dubbed "upper-bay" and "lower-bay," respectively — and attempts a rough cost-benefit analysis of all three options for state lawmakers, who probably would be the ones signing off on a plan and figuring out how to pay for it. The analysis shows all three plans would save the state about $44 billion in damage in a hurricane that makes landfall near the western end of Galveston Island and continues toward downtown Houston. But the cost of the lower-bay plan is estimated at $7.6 billion, while the upper-bay plan and the mid-bay option each would cost about $2.8 billion. The damage to residential properties under the upper-bay plan is projected to cost twice as much as the damage to industrial properties. Ike, the state’s costliest storm, resulted in $29.5 billion in total damage. The mid-bay plan “produces larger regional benefits" than the upper-bay solution "at a much lower cost" than the lower-bay plan, Blackburn said. Whether the SSPEED Center’s peers — or policymakers — will rally around the new plan remains to be seen. Texas A&M University-Galveston professor William Merrell, who conceived of the Ike Dike, said in an interview Monday that he still thinks he’s “taken the prettiest girl to the prom," noting that dozens of coastal cities have backed his plan. State Sen. Larry Taylor, R-Friendswood, said he's open to new ideas but views anything other than the Ike Dike or a something similar as secondary. "I think that has to be the main focus and the centerpiece and these other things may very well be supplements that may be necessary, but I just don't want to lose sight of the main thing, which is that coastal barrier," he said. 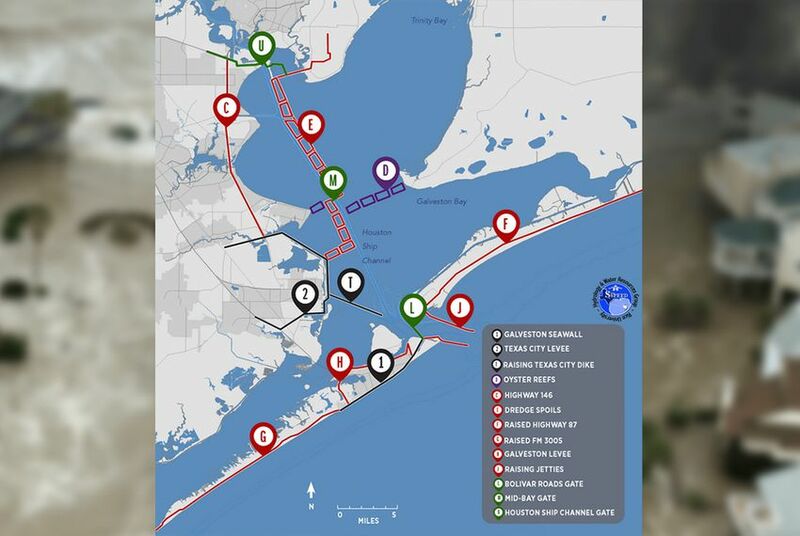 In the seven years since the Category 2 Ike barreled into the eastern end of Galveston Island, local leaders and academics in the Houston region have agreed that some measures should be taken to better protect the densely populated area whose refineries hold the key to nearly 30 percent of the nation’s fuel-production capacity. But that is mostly where the consensus ends. SSPEED Center officials say they are working closely with all local, state and federal entities to avoid duplicative efforts. But some duplication may be inevitable. “Academics are doing studies on this and they’re very valuable, but they don’t build things,” said Robert Eckels, a former Harris County judge who now is president of the Gulf Coast Community and Protection District. Formed in 2010 to figure out the best route to take, the district is about halfway through its own three-year study — funded by a grant from the Texas General Land Office — that involves an examination of previous proposals and its own storm modeling. Eckels said the district wants to ensure that anything it designs can be constructed and meet federal standards to receive federal funding. "It has been seven years since hurricanes Ike and Dolly. We are still just as vulnerable now as we were then," Texas Land Commissioner George P. Bush said Monday. "It is time to take action and move forward — and that's what we're doing with this agreement." Meanwhile, Merrell, the Texas A&M-Galveston professor, contends that academics have led the way on storm preparedness while government officials have sat on their hands. “We don’t agree on all things,” Rice’s Blackburn said, “but we’re trying to find common ground." Disclosure: The Houston Endowment is a major donor to The Texas Tribune. Rice University has been a corporate sponsor of The Texas Tribune. For a complete list of donors and sponsors, click here.